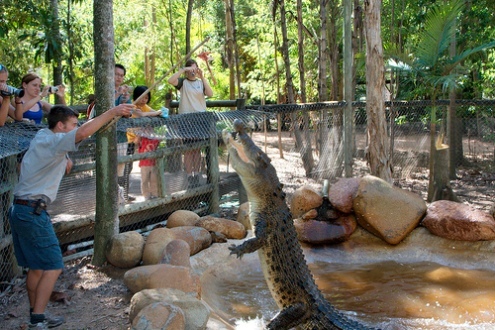 Billabong Sanctuary is a great zoo park. It is just south of Townsville in north Queensland. There are the native Australian animals such as koalas and kangaroos, dingos and wombats, freshwwater and saltwater crocodiles and other reptiles; and there are also some introduced ones such as water buffaloes. Birds include Australia's cockatoos and parrots, as well as the endangered southern cassowary that lives in the tropical rainforests of north Queensland. There are also crocodile and cassowary feedings, reptile show, handling of pythons, birds, lizards and baby crocodiles, and wombat and koala experience and photos.